Cute Boy Diaper Cake with a Monkey on Top! 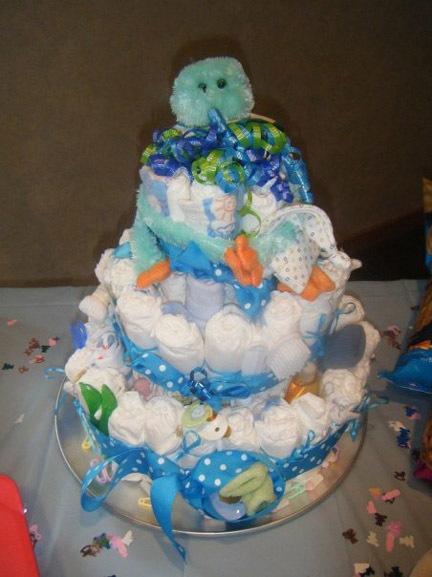 Take a look below to find out how Angela created this adorable Baby Boy Diaper Cake. She shares with us her instructions and a great photo. She has some great money saving ideas to make a diaper cake and some cute decorations, including a Monkey on top! I used more diapers than suggested to provide for a stable base. I used a 20 oz. bottle of baby shampoo for the center of the first and second layer and I used a 5 ounce baby powder for the last tier. I basically followed the instructions as shown, and my diaper cake turned out awesome. Most of my items I bought on clearance from Target and Wal-Mart, and I bought other items from the Dollar Tree, such as the Monkey on top. His hands were velcro so he was able to grab the top layer, and it helped secure it. I don't have a picture of the back, but he is sitting on a baby teething ring so his head peeks over the top. I bought a travel kit at Wal-Mart that had travel sized lotions and shampoos that I hid in the layers. I put forks and spoons on the cake, pacifers, socks, a baby bib, baby towels, a hat, and some various other items. I put my cake on a pizza baking pan from Wal-mart it was only a few dollars. Awesome web site, highly recommend making one for a baby shower. Thanks Angela! Truly an adorable cake!! If you want to make a diaper cake and need step-by-step diaper cake instructions with detailed photographs, then look no further!